Pary Moppins: Perfectly Practical #169 - Which Sugar? Perfectly Practical #169 - Which Sugar? When we lived in England I learned early on the importance of knowing when to use white sugar and when to use brown sugar. And I'm not talking about the molasses-y brown sugar used in baking. I'm talking about the lovely brown sugar that is called "demerara" on the other side of the ocean or "turbinado" Stateside with the "Sugar in the Raw" brand being the most identifiable. Basically it's a less processed sugar with bigger crystals. You would think that the color or type of sugar is of little importance but you would be gravely wrong. 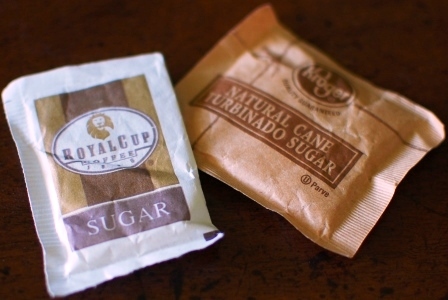 In each tea shop or friend's house I darkened the doorstep of, I found that on the table/tea tray there would be two types of sugar: white sugar and brown sugar. It was her that told me that white sugar is for tea and brown sugar is for coffee. That made total sense. Sort of. From that point on, I used only the correct sugars in my drinks and you know, I could taste the difference. The demerara (brown) sugar tastes so much better in coffee than white sugar. Conversely, the brown sugar does not taste right in tea. I will have to let PB know packet to use at starbucks next time we treat ourselves. I love it when coffee shops have those "sugar in the raw" packets. Now I know why I always reach for them instead of white sugar. I love demerara sugar! But for tea, I prefer honey.